This past Saturday, 4thAugust, we were once again involved in the annual Walking Home event. 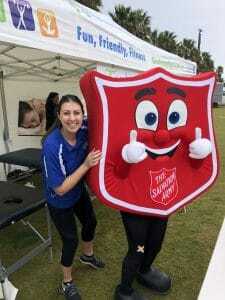 For those of you who don’t know what it’s about, it is an event run by the Salvos to raise awareness and much needed funds for homelessness in the Geelong region. 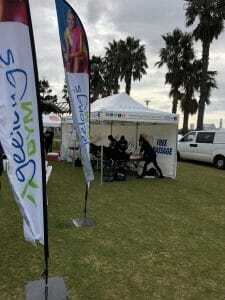 Participants embark on a one day 37 kilometre walk from Queenscliff to Geelong or, if they’re not quite up to the entire walk, from entry points at Drysdale, Leopold and even the Geelong Show Grounds. The fact that it’s a walk and not a run is one of the things I love about this event, because it opens the door for so many more people to become involved. Not to mention the social side of a walking event – I have loved seeing how participants start talking and interacting with the walkers in front and behind them, making connections and sharing life stories. The walk just has such a great community feel to it! 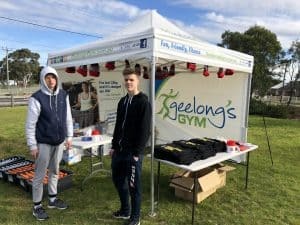 Geelong’s Gym was part of the committee who initially conceived this event eleven years ago and we’ve been involved ever since – both in an organizational capacity and as sponsors of this truly worthy fundraiser. We even provide a team of massage therapists who greet the walkers at the finish line and help ease the aches and pains of a long walk. We get involved in such a capacity because it’s part of our corporate philosophy to be active in our community. In fact, that’s one of the joys of being a local business. We do what we do at Geelong’s Gym because we love to help people live healthier, better, stronger, longer lives – no matter what age they are. And that’s exactly why it’s so important to us to reach beyond the gym doors and impact the lives of other people in the community too, especially those in need. This year’s figure is not yet available, but last year Walking Home raised over $50,000, which makes every bit of time, effort and financial contribution on our behalf well worth it! I strongly believe every business should give back and have a program or way of helping a charity or group in need in their community. For Geelong’s Gym, it’s not just about Walking Home. There are a number of other local events throughout the year we get involved in or support with fundraising opportunities. And you know what? It’s one of the most rewarding things about being in business!